A successful team requires a blending of supportive and successful partners. A major part of our successful team is the horses that partner with Cain, Roberta, David, and Judy. These horses have been part of Cain Quam's unique horse training program. 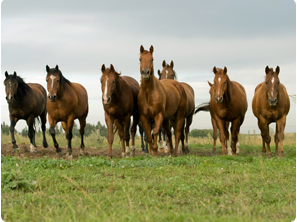 The horses have learned to respectfully partner with humans and move more effectively into their thinking brains. The horses that are utilized in the program are not average horses. They all have been a part of Cain Quam's horse training and have often been used in the program for many years. They have been trained to be safe, respectful, and "know" the program. In other words, they are well-trained for any obstacle and/or command that they will be given. Cain Quam determines which animals will be used, and ensures they are safe and in good physical and mental states to be utilized in the program. After each day the horses are massaged and examined. They are turned out into the pastures to de-stress after each day's program. These horses have joined with the Unbridled trainers and participants in numerous workshops and individual sessions. The horse's participation has assisted many participants in achieving their session goals.